In loving memory of Mr. Terry Vosdingh, who passed away at Wilson Memorial General Hospital, Marathon, on Monday, October 23, 2017 at the age of 69. Pre-deceased by his parents Albert and Erma Vosdingh & sister Diane Pederson. He is survived by his wife Sue, his children Terry (Heather), Tina (Marc Hunt), Shawn (Karen), 6 grandchildren Travis, Maegan, Samantha, Tori, Brian and Tonya. Also, by his sister Darlene Truchon (John), 2 great grandchildren and by many nieces, nephews, sister-in-laws and brother-in-laws. A graveside service will be held at Charlton Cemetery on Thursday, October 26, at 11:00 am. In memory contributions to Wilson Memorial Hospital, Marathon or Alzheimer Society or Westway in Thunder Bay will be greatly appreciated. Condolences, contributions and memorial candles may be left at www.mcdonaldfuneralhome.ca. 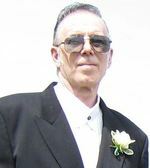 To send flowers to the family of Terry Vosdingh, please visit our Heartfelt Sympathies Store.